We hope you’ve enjoyed our week of features with author Clinton Harding and learning more about Bad Monsters and the Our Monsters Chronicles. For us, it’s always a pleasure to host Clinton on the blog, he’s shared some fantastic guest posts with us over the past couple of years (read them here) and we look forward to hearing more from him in the future 🙂 For our last feature of the week, we are excited to share with you an excerpt from the opening of Bad Monsters and we’re offering one reader a copy of the book in our giveaway today – just pop a comment in the post to be entered! Glass crunched underneath the soles of General Mauser’s high-polished boots. The sound gave him pause and he fought the urge to grind his teeth with each additional step. Four teenagers… four children managed to move through a heavily fortified military base with so much ease?! Shards of glass lay scattered about the circular room. Above him, a breach the size of a small adult human punctuated the steel framing of the domed ceiling, the metal bent inward, the glass panes gone. The sound of groaning metal and breaking glass tore at the general’s mind, a dull razor against paper. How many internal hybrid attacks had Carpenter endured in the last few years? Uncountable. That is the hazard of working with beasts, with monsters. You don’t walk into a minefield and expect not to step on at least one land mine. In the past each monster incident had ended with the escaped hybrids sedated, the threat neutralized and contained. Minimal paperwork required. This time… a handful of soldiers lay in the infirmary and security found three high-ranking officers handcuffed to a pipe underneath a sink. Children had fought and subdued Mauser’s soldiers, had handcuffed his lead scientist, his head of security, and a captain. Not hybrids but children. There would be a hand-cramping amount of paperwork to fill out in order to explain this mess… Mauser would not subject his hands to that ache, his incompetent subordinates would. At least no other hybrid managed to escape its bonds, except the four. Mauser forced himself to stop grinding his teeth. He took in a deep breath and held it for the space of half a minute before exhaling. None of this was supposed to happen. The hybrids were to be taken from the children, brought back to the base, examined, and contained once more. If it were not for his own son’s blubbering tears and his wife’s insistence that he and the boy have a “man-to-man” conversation, the General would have been at the base last night. Now the newest, youngest batch of Carpenter hybrids was gone… again. This was not part of the original plan. “We adapt or die,” the General muttered under his breath. He had spoken these words to himself once before. It had been two weeks after the fallout in New Mexico, after the monsters ripped their way through to his world, his country, and proceeded to tear apart rightful citizens of these United States. He picked up the pieces of tragedy those many years ago and refocused disaster into opportunity. Glass crunched and scraped as Mauser turned on his heel. Professor Martin Graves stood in front of a stainless steel worktable polishing a set of surgical instruments, likely to keep his hands busy. He had changed out of his surgical scrubs and into a pair of rumpled suit slacks and a white un-ironed shirt with the sleeves cuffed up past the elbows. Tired and miserable, Graves kept his back to Mauser. That spoke more than words. Can I trust him? Mauser believed it possible that Graves had helped his son and his son’s monster escape Carpenter. How else could the boy, his friends, and the beasts have ghosted past security? They had certainly made an entrance. From what Mauser understood, it was his lead scientist’s badge after all that allowed the group of teens access to the underground facility. Then there was First Lieutenant Greg Marshall, leaning against the doorway, rubbing his wrist absently. Another family man, one more devoted than the absent Graves, for sure. The reason why Mauser brought Marshall to Carpenter was the soldier’s values. His commitment to his family. That loyalty made a man strong, made him willing to die for his beliefs and loves. Yet a family man’s priorities centered on his family, sacrifices were not easily made outside that inner circle. Neither man dared to face Mauser’s disapproving gaze, Graves and Marshall wanting to avoid admonishment for the blundering display of idiocy the previous evening. Mauser glanced at his wristwatch. Morning. The night had slipped by as quickly as the children and the beasts. As he lowered his arm, Mauser caught the sight of the exam room table. Strange to see the restraints not snapped with great strength or cut by a knife. The undone brass buckle of the two-hand-span wide belly restraint swayed, nearly brushing the ground. Its casual ease taunted Mauser. Yes, it had been that easy. No extraordinary powers needed. Both subordinate officers had offered their stories to Mauser. Neither had known their sons would break into the mountain base. Nor did they understand how Grave’s son had burst through the domed ceiling like a superhero and walked away without a broken bone. Stern lectures and a month without television or video games would not be enough to produce hangdog teenage faces and second thoughts. Graves and Marshall would write reports later and their hands would indeed cramp. If nothing, Carpenter was a government, a bureaucracy, right down to the last scrap of paper and drop of ink. I should have fought harder to keep the families away from these projects. Mauser chided himself for that moment of weakness when all this started. Mauser believed his men needed their families close. He also wanted to keep the soldiers from rotating to new posts, to protect the integrity of the confidential operation and to hide the project in plain sight. For those reasons he allowed Carpenter to grow around a town, for the civilians and military to merge into a cohesive unit. Mistake number one. A recent mistake was letting Sergeant Major Scott leave the room. Scott headed the Lightning Squad. With tanks strapped to their backs, each filled with a nerve-twitching amount of hydro-electricity, the team was effective in controlling a hybrid. Scott also had a reputation for getting things done, costs be damned if he preserved a greater number of lives. Mauser’s kind of soldier. For what Mauser needed next, Scott was the preferred soldier. “I’m sending out a team to recapture the escaped monsters,” Mauser said to neither man in particular. Striding to the door, to where Marshall stood, he made to leave. The air stirred as the other men surfaced from their downcast reverie. Glass crunched. How many of the panes did the Graves boy bring down? “I’ll establish my team immediate—” Marshall started to say before his commanding officer cut him off. “No,” Mauser said flatly, simply, and louder than necessary. He intended for his voice to roar like thunder, to straighten backs. The General commanded authority and he would have obedience. That is how you ground someone, Mauser acknowledged proudly. “Sir, if you don’t mind me saying,” Marshall began slowly, choosing his words carefully, not wanting to again question orders or speak ill of an enlisted man so near his own rank. Mauser cut off the man with a simple gesture. This young military officer was not thinking straight, he’d shortly before seen his son walk out of his life, disobeying parental orders to extricate himself from the military’s affairs. In the wild, if a cub questioned the lion, the lion would eat the impudent pretender. Plus, Mauser was unsure he could trust the father of one of the teens who’d stolen the hybrids. Not at this moment anyway. Graves dropped a gleaming scalpel, or perhaps the professor lightly tossed it down. The tool hit with metallic clatter. “You mean Scott has more experience with hybrids,” Graves said, not turning his gaze to meet Mauser’s own. Mauser arched a bushy eyebrow, raising it over the rim of his spectacles. Mauser did not flinch or acknowledge this information as factual. Silence was sometimes more powerful than words. Silence could unravel a man’s composure more than a passionate shout. Marshall was a family man. He cared for his son no matter the boy’s transgressions. He was also ten years younger than Graves and that gap was more apparent the closer you stepped to the edge for the man’s love for his child. Turning the knob, the lock disengaged with an audible click. Pushing the door open, Mauser walked out. He paused when his First Lieutenant spoke out unchecked. Mauser chose to ignore the reckless passion in the soldier’s voice, to turn the cheek at the slap. Only now had Marshall validated the General’s decision to involve Scott. Not a recommendation… an order. “Let it go, Greg,” Graves interjected softly. Getting Russell a viper would have been safer than one of the monsters, Mauser mused with wry humor. Clipped to his belt, a handheld radio crackled and a voice called out to Mauser. Mauser answered that he was listening and then waited. More white noise crackled. Mauser answered with an affirmative and placed the radio back on his belt, the opposite side from his firearm. He did not excuse himself. Hood over her head, all was dark and muffled. An expansive sea of despair and mysterious finality stretched out before her. Mikaila could hear her panicked breathing even more acutely in this hooded-world. She was more aware of her heaving chest as it labored out shallow breaths. Her ears pounded with the rushing of blood to her head. Back rigid, shoulders hunched and cramping, she nonetheless decide to prepare for… well… anything. A firing squad, maybe? Did the military execute traitors with firing squads these days? Regardless of her possible execution for treasonous acts against the United States, Mikaila found she was not worried about herself. I hope Isis is alright, she kept thinking, steeling her resolve and wrapping that armor around her. She’s with Jon. She’ll be fine with Jon and Bo to take care of her. Thinking about Isis only forced silent tears from Mikaila’s already damp eyes. Underneath the hood, the moisture made the hood-world experience even more humid and uncomfortable, hard to breath. Jon was her second concern. Not for his safety. He was smart and thought fast on his feet, though his mouth ran faster. Mikaila laughed at this thought and nearly sobbed perceptibly that time. Someone, a voice far away, told her to be quiet and settle down. The voice was from one of the soldiers who had picked her up at the bus station in Carpenter. The soldiers had come upon her not even two seconds after she stepped off the bus and onto the platform. She did not hate the three men and one woman as they were following orders. Their postures and gentle—yet detached—treatment of her spoke volumes. Her thoughts returned to Jon. His words to her in those short moments when they split paths were as clear as the sounds from the world beyond the hood. Jon’s look, the fiery blaze of betrayal in his eyes when she told him she could not come along with the group, broke her heart. He would never forgive her. However, Mikaila could not betray her parents and leave them alone in Carpenter with no idea where their only daughter had run off. Their possible pain was greater than her own discomfort was when standing in front of Jon and her apprehension at this very moment. Then there was Isis. Poor, sweet Isis. What would she think when she woke from her drug-induced slumber? The hybrid would wail, scratch and try to take flight in order to search for her human companion. Mikaila knew this as true. The hood pulled away. Her curly brown locks tumbled in front of her face, which she scrunched up. Sterile light flooded the cheerleader’s vision and blinded her, pain squeezing her temples and forcing her eyes shut. Fresh air caressed her face, refreshing and full of life compared with the stink of the confining hood. Bursts of black spots appeared in front of Mikaila’s gaze as she tried to open her eyes again. For a brief second of delusion, one of those dots stretched and morphed into the silhouette of an avian hybrid. Then the black shape rose into a blazing sun and vanished. Please, Jon, keep her safe. Keep Isis from flying to me and to this hellish place. Mikaila blinked. She squinted one eye, closed it, opened the other eye ever so slightly, and then closed both. As her vision cleared, she slowly allowed her eyes to open and reveal her surroundings. Standing before her, a black human blob of a shape came into focus and took the shape of General Mauser. Bunched up in his hand was the dark hood that had blinded Mikaila. The General tossed it on the table between him and her. Mikaila attempted to lift her arms. The handcuffs binding her hands, attached to a longer chain affixed to a u-shaped bolt in the floor underneath the table, kept her from raising her arms higher than her chest. She tilted her head while holding out her hands in placidity, the chain jangling. “As comfortable as I can be, sir,” she answered, trying to channel as much of Alice’s blind bravado as she could. This man before her, who wanted Isis and the other hybrids as lab rats, would not get satisfaction from her pain or discomfort. A moment passed in which she thought the General might smack her. She prepared herself. Suppressing a shudder, Mikaila bowed her head and brushed her hair back from her face and behind her ears. Her bound hands made his difficult but she managed, she needed to take her mind away from this military giant. From what Russell said about his father, the General was more than a little narcissistic and more than a little mean. She agreed. “If you’re going to ask me where my friends are going, don’t waste your time,” Mikaila said. Her words came out more squeaky than confident, making her sound more like the mouse caught between the lion’s claws. This made her shrink in her chair a little. The table creaked as Mauser straightened and took his weight off the table. Not a fat man, he certainly didn’t have the whipcord thin and sinewy build of a soldier in regular combat. Soft around the middle, he still had some strength in his chest and shoulders. Stress had etched the wrinkles across his forehead and around his eyes, not smiles. His slicked back, peppered hair was thinning, yet he retained the sharp, severe widow’s peak that seemed to touch the space between his eyes. That felt good. A wave of release left the cheerleader in a rush of air. “I didn’t make myself clear… I don’t need you to tell me, young lady,” Mauser retorted flatly. Mikaila snapped her head front and center, focusing her attention. Mauser’s face betrayed nothing. His expression was not smug or remote; when he did elaborate, it was matter-of-factly and seriously. A frightening realization came into focus. Something that Russell, the General’s son, had been worried about and everyone shrugged off. For a while, their little group, their developing family, felt safe and comfortable. No one from Carpenter had come after them. Jon said he saw no surveillance cameras watching him when he found the hybrids the day of the fieldtrip. Yet, when they all broke in to the underground base, soldiers were on the four teens almost immediately upon identifying the threat. “Our reasons are our own. Project Evo is classified, meaning you are not authorized to have that information. However, let me give you this, young lady. I took a great chance in listening to your friend’s father when he suggested this field test. He seemed to think the monsters wouldn’t rip you five to shreds. Professor Graves has immense faith in the beasts he created; he’s wrapped up too much of his heart in them, he believes nurture wins out over nature. I had my doubts, especially with my witless son involved. Don’t mistake me, I love the boy, but sometimes his head is not fixed in the correct direction. “They were trying to protect us! Protect Trick!” Mikaila nearly leapt from her seat, the chain attached to the table preventing her from getting far. Mauser stood still. Unflinching. No wonder Russell was so scared of his father. The man was an uncompromising brick wall. Run headlong into a wall and it might break bones. Would you expect an apology from the wall? You cannot reason with a brick wall. You can only avoid the headlong collision. Mikaila sat down hard, concentrating on slowing her pulsing heart. Able to breathe and speak without her words tumbling out, Mikaila asked the question that been nagging at her since the soldiers picked her. A wide smile stretched across the General’s lips. For some reason, the delight in his expression was more menacing than his cold authority. Mikaila waited, saying nothing, brushing her hair back out of her face again—she wished for a hair tie or even a rubber band right now, her curls always got in the way. She watched Mauser, trying to exude sheepish innocence. Hateful words flew from his lips. Each was a blade meant to slice, rip, and cut deep to the bone. He wanted Mikaila to feel what he felt in this moment. Immediately he regretted throwing those daggers. Mikaila showed him her back and dipped to grab up her bags. As her fingers curled around the plastic handles, Jon reached out with one hand and took hold of his best friend’s wrist. He thought better of the amount of pressure he used. Instead, he loosened his grip and placed his other hand on her hip, motioning for her to stand. This was the first time Jon was aware of his best friend’s curves. Soft. Feminine. Jon wanted his hands to explore Mikaila’s curves; her hips, her waist, her collarbone, her neck, and every other mysterious bend. A tingle surged from the tips of his fingers to his wrist. His hand nearly jerked away, but it stayed, not wanting to let go of that hip. Sobs. The word daggers had cut her. Mikaila slowly rotated around on her heel to face him. Tears flooded her big brown eyes. Normally so much light shone from her eyes, now, her eyes overflowed with weeks of hurt and pain. Jon quickly lowered his own eyes and focused them on his hands in hers. Was every part of her so soft? Part of Jon wanted to discover the answer. This frightened him and yet it was a good fright. She snorted. The abrupt sound drew Jon’s gaze up to Mikaila’s face. She wore little makeup, if any. Her eyes were watery, red with the beginnings of puffiness, but there were no mascara streaks. There was no anger there, as Jon expected, only a playful impishness. They both gazed seriously into each other’s eyes and a heartbeat later broke into a fit of giggles. The laughter was as loud as cracking ice. When they both wrestled back control, Jon let go of his best friend’s hand and let her wipe away her tears. “Are you ever serious?” she asked with an exasperated sigh, there was a hint of annoyance there. “Rarely.” Jon’s smile vanished, knowing that this moment was the time to be serious. She cocked her head to one side listening. A brown curl came loose from behind her ear. She made to pull it back. Jon beat Mikaila to it and she blushed girlishly. A bus pulled in the station, the breaks squealing with effort. “Because…” Mikaila was reaching to pull the truth from him, she wanted it, her eyes were hungry and trying to eat Jon’s soul whole. This is the moment I should have had with her… I should have said this before and not been a complete spaz! Mikaila’s eyes lit up brightly, as they always did when she saw him or when she looked at the world and simply saw bunnies bounding and rainbows arching. Jon felt special in that moment, chasing bunnies underneath the rainbows. A fluttering of wings beat inside his chest, urging him to press himself against Mikaila and fly them away. At his feet, Jon’s backpack rustled and nudged his leg. Bo probably wanted to throw up, listening to Jon and Mikaila act out a scene from some cheesy young adult novel with vampires or some such stupid stuff. Jon ignored his hybrid friend and instead rose up on his tiptoes and leaned forward toward Mikaila’s lips. Again the backpack rocked against Jon’s leg. Jon gave Bo a gentle kick. Mikaila’s lips, a gentle pink, moist and inviting, opened slightly and came to meet his. Her curly hair fell forward and brushed against Jon’s cheek and the smell of buttery popcorn popped in his nose. And Jon was back on the bus. When he’d fallen asleep earlier the backpack with Bo inside had been sitting on the seat next to him. Not anymore. The backpack and Bo had rolled on top of Jon’s lap. The nylon of the pack rose and fell with the sounds of wet, flapping snores. With that, the appeal of moist lips and kisses exited the building, leaving behind a shameful heat around his neck. Red anger flooded into Jon’s vision, except… he didn’t know who he was mad at. Was he angry with Mikaila for turning her back on the group, on Isis, on him? He slumped down in his seat, blew out breaths of frustrated air, and fingered the knots of threads of the friendship bracelet tied around his wrist. Or am I mad at myself for not stopping Mick from leaving? Jon rubbed the sleep from his eyes and tried to order the nauseating wave of muddled feelings inside him. Would he have told Mikaila he possessed romantic feelings for her just to keep her from leaving the group? And how much of Jon’s dream was rooted in truth? If he followed the root, would it lead him back to some tree with Mikaila sitting underneath it, waiting to shower him with kisses and embrace him? Better question, would he run to her with open arms? He touched his cheek, expecting to sweep her brow curls away. All he found… confusion. “Jon, you wake?” Bo whispered with clear concern, the hybrid’s gruff voice muffled by the confines of the pack. Looking down at his pack, Jon caught the glint of two eyes staring back at him through the darkness of the backpack’s main compartment. Each was like a chip of obsidian. The nylon weave of the backpack shifted, making a rough rubbing sound as Bo snuggled down into a comfortable nest within the compartment. Peeking at the crack separating the two seats in front of him, Jon noted Alice and George sleeping. Her head rested on his broad, muscular shoulder. To see two of his friends so connected and happy within each other’s casual embrace left Jon feeling lonely. Don’t forget confused. I’m a whole heap of confused. Outside, the sun bowed to the entrance of night. As the season was fall, the time could only be six now. The group of teens and hybrids had been traveling less than a full day. An escape from a military facility. Switching buses three times at random to throw off any trail the Carpenter military might attempt to follow later. No one was fighting sleep. Jon checked on Isis. Inside the pet carrier Mikaila had brought with her—to shuttle the avian hybrid around with minimal question from random gawkers—Isis lay in a tortured sleep. One tiny wing covered her head. Her body shook with distress. Like Jon, the hybrid also could not escape her dreams. That was enough of a reason for Jon’s anger to return. He wrapped himself in that warm but threadbare blanket. From within one of the backpack’s compartments, Jon took a palm-sized mp3 player. He shoved the ear buds in and turned up the volume, skipping to a song about mad sorrow, about love lost and stoking the fire within the empty space in the heart until it raged. Quickly, Jon found sleep through the smooth motion of the bus’s progress on the darkening highway combined with the screams of his heavy metal. If only the sleep could have lasted longer. In Clinton D. Harding’s debut novel “Our Monsters”, Jon Graves and his friends escaped their parents and the military, leaving behind the only home they’d ever known, the small town of Carpenter. But their freedom is short lived as they find themselves in more danger than before they left Carpenter. “Bad Monsters”—the second book The Our Monsters Chronicles, released March 2014—picked up where its prequel ended. Jon and his friends are on the run and hunted and by General Mauser and his military dogs. Jon can practically feel them breathing down his neck, as the jaws of the military dogs snapping at his heels. Blood is spilled, friendly and not, and now Jon must answer his friends’ questions sooner than later, or risk one of those friends dying. He’s just not sure he’s the person to be deciding their fates or if he, Alice, and George are fully prepared to walk away from their normal lives. A farm in northern California may serve as salvation to this scared, but brave, group of teenagers. However, can they trust the inhabitants they find there, who themselves have a history with Carpenter? If Jon can talk his way past the shotgun in his face, he might just discover what he and his friends need; answers about the history of Carpenter, the hybrids, the powers the teens borrow from their hybrids and who are the true monsters. In all this confusion and danger, Jon may also find a young woman who can help heal the wounds left by Mikaila when she left him and the group. Pick up “Bad Monsters”, the second installment in The Our Monsters Chronicles, is now available and can be found in e-book and paperback form at major online retailers: Amazon | Barnes & Noble | Smashwords. When Clinton D. Harding is not busy wrestling and taming wild Scottish Terriers in wilderness of Oxnard California, he’s using a magic pen he pulled from a stone to craft new worlds filled with fantastic beasts and evils that need fighting. 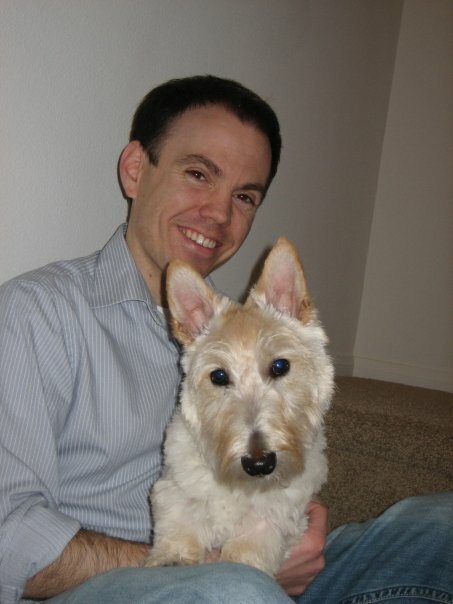 He is also the author-publisher of The Our Monsters Chronicles, a YA series of novels that combines fantasy/sci-fi elements with horror chills. For more information about Harding and his creations visit his website, like him on Facebook, follow him on Twitter, or become a fan at Goodreads. 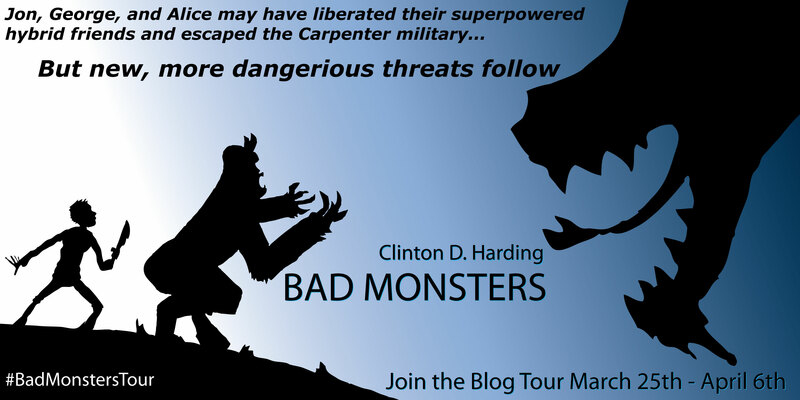 This entry was posted in Writing and tagged bad monsters, blog tour, clinton harding, excerpt, our monsters. Bookmark the permalink.